We need 2 - 3 acoustic musicians. We hope they can move around from indoor to outdoor , as we expect guests to be both places. Large house and large back yard. No stage. No limited performance area. Just play inside while guests arrive and for a little while as everyone gets into the fiesta spirit. Guests to arrive at 5pm. Music should greet them. All guests should be here by 6pm. If there is any delay in guests getting in the fiesta spirit, I would like the music to continue for another 30 min - 1 hr. I hope any additional time would be possible IF needed. Indoor and outdoor fiesta. This is a “stock the bar” shower for both bride and groom. We may need a few minutes over an hour. Also, we are in desperate need of a Taco truck! Please let me know if you have any contacts that might help! Arriving on the music scene in the late 19th century, Mariachi Bands brought an upbeat yet traditional sound to Mexican culture. With a blend of guitars, violins, trumpets, the guitarron, and the vihuela, Mariachi music can truly liven up a party! The upbeat authentic Mexican folk music is the perfect accompaniment for wedding receptions, Cinco de Mayo parties, and so much more. 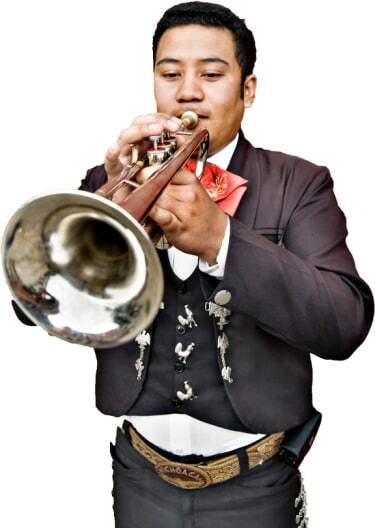 Search for Mariachi Bands in Murfreesboro, Tennessee above. Please note that these Mariachi Bands may also travel to Christiana, Readyville, Fosterville, Link, Rockvale, Bell Buckle, Lascassas, Beechgrove, Milton, Arrington, Eagleville, Bradyville, Unionville, Woodbury, Auburntown, Wartrace, Norene, Nolensville, Chapel Hill, Antioch, and Alexandria.